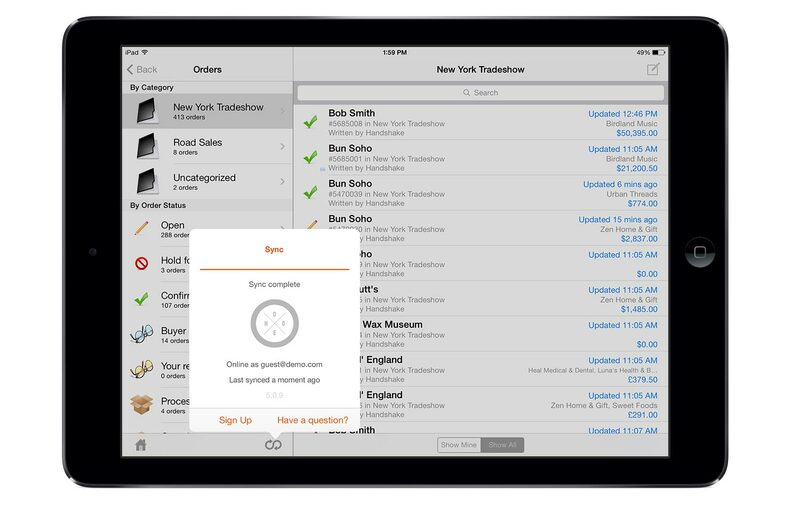 Handshake’s mobile sales order entry system communicates with the Handshake website over an advanced sync system that connects the Handshake Rep app to Handshake Hub. Instant sync gives you immediate, two-way communication of order, customer and product information, ensuring both your sales team in the field and your customer service team in the office are totally aligned and up-to-date. Sync is triggered automatically on key actions, like when an order is placed in the field, so that it is immediately available on the Handshake website for back office review and confirmation. Handshakers love our sync feature for a number of reasons. First, it removes the need for customer service to manually enter submitted sales orders into the computer - wasting a ton of time, money and inaccuracies caused by human error. Second, instant sync drastically decreases order processing and fulfillment times - an operational efficiency that gets you paid more quickly and makes your customers happier. Using Handshake offline? Your orders will automatically sync to the Handshake website as soon as you have Internet access again. On the flip side, any order, customer, product or settings updates that have been made on the Handshake website will instantly be pushed out to the field, fully equipping your sales reps are to sell with more confidence and accuracy.